“I’m Gerardo, 35 years old. I’ve suffered from scoliosis for over 20 years; when I was a child and until around I was 13 years old I didn’t really notice anything. By the time I started to “stretch” at 13, I had gone through some problems that had made me gain weight out of anxious eating, so I was pretty fat through my teenage years, and even though I noticed back pains, I attributed them to my excessive weight. At the same time, the obesity covered up the curved back, the hunch I was developing. Only after I did a rather drastic diet that made me lose around 30kgs in 3 months, and I noticed that my back had a curve, it was noticeable now, and my back pains persisted, sometimes becoming unbearable. Rather than getting praises for losing weight at school, I got teased a lot because of my curved back. But what bothered me the most was the pain. I couldn’t be sitting too long, I couldn’t be standing too long, as my mid and lower back would start hurting unbearably. My only relief was laying belly down in bed. Sleeping like that became a habit, and even though now I know better, I still catch myself doing it sometimes. When I was 19 or 20, I had developed a big complex about my back and I was paranoid about it. Everytime I talked with someone I would see them correcting their back posture, straightening up as they talked to me, and that made me feel self conscious, horrible, different, a freak of sorts. So I told my mom I wanted to fix it and we searched for a chiropracter. We found a pretty good one who used infrared and heat on my back, and taught me a few exercises; I even bought one of those posture correctors, you know, those things you strap around your waist and back and are supposed to “pull” you back. Relief and slight improvement, if any, were always temporary, and to be honest, I was too impatient to be consistent and stick with the exercises and treatment. I quit. I just decided to ignore anything related to my scoliosis. Fast forward to 2015: I’m living and working in Indonesia, and after many invitations and friend singing praises about its multiple benefits, I decided to try out bikram yoga. It wasn’t really about my scoliosis, I just wanted to lose weight because the indonesian cuisine and the Jakarta city life can put extra weight on you very quickly if you’re not careful. Now, my only yoga experience had been practicing Kundalini Yoga a few years before, and liked it quite a lot, plus I have a tendency to look for consciousness expansion, meditation, and related subjects. So I thought it would be pretty much the same. In summary, my first bikram yoga class was a total fiasco: I left the room after only 30 minutes, I thought I was going to faint, throw up, and die, not necessarily in that order. But after the pain and dizziness, I was surprised to discover I felt really, really good. Open. So I decided to go back the next day and do my best to stay the whole class, listen to the teacher and my body, not push myself too hard and breathe. I did much better, and I knew I had discovered something. So I kept doing it until now. It’s been 7 months now, and the funny thing is, I discovered on that second bikram yoga class, that more than 15 years ago I had done the cobra and the full locust poses as part of my treatment, and here I was doing a much more comprehensive series of exercises! The first three months some poses, like fixed firm and camel, were really painful to do, and I was so eager to do them that I injured myself a bit and had to take a week off, but when I charged back, I could feel every fiber and cell readapting and realigning with my new determination. Now I can do both postures without any problem. So how’s my back now, you might ask? Well, the curve has noticeably decreased, specially after I took the 30-day challenge. More importantly, my back pains are gone. Pain kills pain, they say here. Very, very true. Changes are visible, not only in regards to my back, which has incredibly improved, but also my entire being, body, mind and soul. Oh, and did I lose weight? 25kgs and I feel great. Bikram yoga started as a remedy but now is a way of life, it is the metaphorical oil that keeps every cog in my path running in harmony (hence yoga meaning “marriage, union). I am definitely never stopping. It works and it heals. I love you.. After Bikram, I become happy! Really there are no words to tell how much you gave through yoga and your friendship to me. I will really miss you.. All the best and hope to see you soon again. 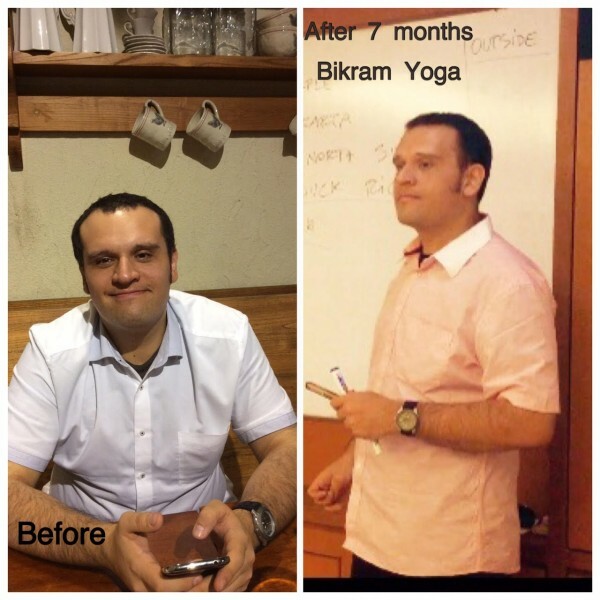 When I found Bikram Yoga at Yoga@42, it was the best discovery in all my years of living in Jakarta. I have been attending classes for just over two years and have to say it is without a doubt the most complete form of exercise around. During my 30 day challenge, there were good days and bad days. But the point is, good or bad, after each session I feel good and energized. I just finished my challenge today. So happy. Thank you for bringing Bikram Yoga and opening Yoga@42. I personally think that is the coolest thing that happens in Kemang. I enjoy doing yoga because of you, such a talented teacher who always pushes your student to be better each class. Thanks for everything. I came to Yoga@42 to try it out “once” and have not turned back! I have given up running and the gym and now can not imagine not having bikram as part of my routine. The workout is amazing and after a few short months, bikram has fixed all my muscle strain and tension after years of running! Thank you again- you’ve built a great yoga community in Jakarta. Thank you so much! I never did yoga and never expected I would like it! But I really enjoyed the hot yoga! It made me feel so good and I really want to keep practicing because as you said it is actually to early for me to leave Indonesia in a few days as I still have a lot to learn! Thank you again and all the best. I ‘Discovered’ bikram yoga at a very stressful time in my life and I have to say it was a single most important kept me same during that period. More than the physical benefits, it’s the mental calm and focus bikram yoga develops that keeps me coming back. Mony is a very special and truly gifted teacher. I’m very grateful for the time I spent here. Thanks, Mony! First joining hot yoga, it was =( . As it runs through, I feel = I, = ), = D and finally ;-D. I finally find a nice assistance of my serious lower back pain. Thank you for sharing your energy and spirits of yoga keep up your passions in yoga and in deed you are a warming and good yoga instructor. THANK YOU, THANK YOU, and THANK YOU =) !